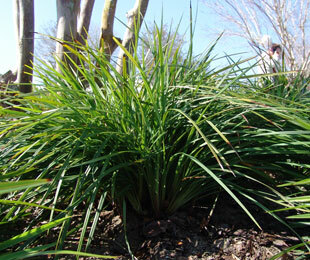 Description: Prestige® Dianella is a fine leaf Dianella revoluta with dark green coloured foliage that forms a very attractive clump as it matures. The leaves fold over slightly giving it good ground coverage. The abundance of blue flowers sit well above the foliage. Size: 50cm high x 60 – 70cm wide. Uses: Specimen or mass planting. Position: Full sun to moderate shade. Tolerates humidity and frost. 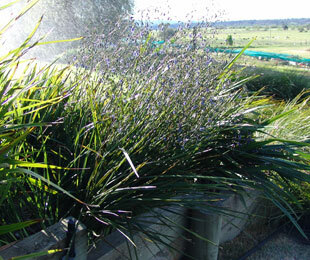 Prestige® Dianella suits moderate heavy to free draining soil types (prefers free draining). Avoid very poor soils. For raised and flat areas only, avoid wet feet. Care: Water as required for 8-13 weeks until established. Plant in a well mulched garden (chunky mulch is recommended). Ensure crown or base of plant is not below soil or mulch level. If required use slow release fertiliser in spring. Remove older leaves as required and cut back 15cm above the ground every 3-5 years if required (will look better with pruning every 3 years, this depends on your requirements). For more detailed information on Prestige® Dianella click here.